"We think the SGD market may be a bit less vulnerable to rate rises than the USD market," said Bank of Singapore chief investment officer Johan Jooste. 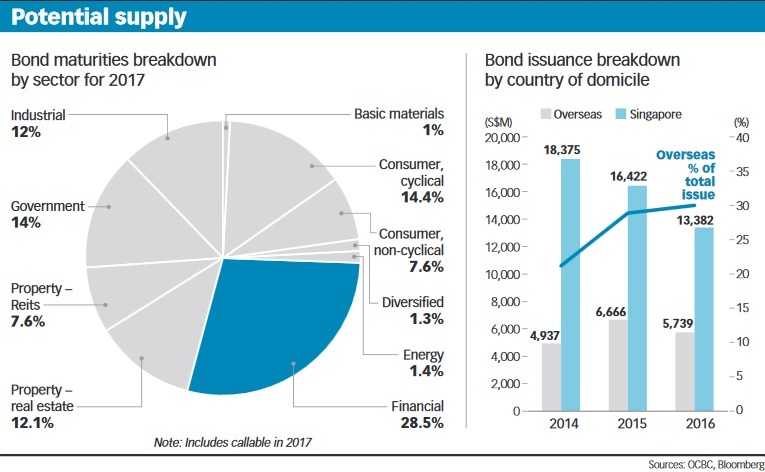 THE local bond market has got off to a slow start in 2017 with only one issue sold so far, despite a considerable pick-up in investor sentiment and increased volumes in the secondary market. In contrast to Mapletree Investments' sole S$625 million 4.5 per cent perpetual bonds last week, five deals worth S$991 million were issued over the same period last year. "The market has just started; there are real flows and secondary market volume is picking up nicely," said Clifford Lee, DBS Bank's head of fixed income. "January often is a positive time for risk assets generally as investors look to deploy capital for the upcoming year," said Todd Schubert, Bank of Singapore's head of fixed income research. The Markit iBoxx Singapore corporates return index on Thursday hit 118.1428, and has risen every day since Jan 1. Its all-time high was 118.4405 on Nov 3, after which it slid to 116.7741 on Nov 24. Mr Lee said volumes are focused on high grade or investment grade credits. Longer-dated bonds were some of the worst-performing over November, said Terence Lin, assistant director of bonds and portfolio management at fund researcher iFast. These include Temasek's 2035s, HDB's 2031s and LTA's 2030s, he said, referring to bonds which would mature in 2035, 2031 and 2030. Since Nov 24, some of the top-performing corporate bonds include high-yield SGD bonds such as NOL's bonds (up 7-12 per cent), Ezion (+3-7 per cent), Gallant Venture (+2 per cent) and Oxley Holdings (+1.5 per cent), said Mr Lin. Selected longer dated bonds also recovered somewhat, he said, pointing to HDB 2031s (+2 per cent), HDB 2026s/2029s (+1.1 per cent), LTA 2030s/2027s (+1-2 per cent) and PUB 2027s (+1.7 per cent). "Overall, the rally in the SGD bond market has been fairly broad-based," said Mr Schubert. Trading on the SGD bonds was very quiet in December as interest rates rose along with the US dollar. There was one interest rate hike by the US Federal Reserve in December which led to SGD interest rates also moving higher but these started to unravel last week. Last Friday, the three-month SOR, or swap offer rate, stood at 0.84 per cent, down from the one month high of 1.04 per cent. The Singapore dollar rose to S$1.43 from the year low of S$1.45 reached on Dec 28. While bond prices have rebounded, there's no denying that new issuance is still in slumber. The market as a whole is taking some time to wake up and it's going to be a year fraught with uncertainties, such as the upcoming European elections and the impact from policy changes by the incoming US president, said Mr Lee. "It's not all bearish, though," he said, and there will be a "lot more supply after Chinese New Year". A report by OCBC Bank last week said the 2017 issuers are likely to be the usual suspects, namely government-related companies and financials although capital requirements from banks could fall given potentially constrained balance sheet growth, notwithstanding rising capital requirements. "Capital requirements for real estate companies will depend very much on the pace and scale of their developments or on acquisitions which are at best uncertain," it said. Refinancing needs are expected to contribute a material portion of the supply, it added. About S$16.6 billion bonds will mature and S$11 billion bonds will be callable in 2017, the bank said. "Notably, more foreign banks could tap the SGD space to fill their capital needs and contribute to the growing proportion of non-Singaporedomiciled SGD bond issues," it said. Overseas-domiciled issuers contributed 43 per cent of total 2016 issuance volume with about 64 per cent of the amount coming from foreign banks. Johan Jooste, Bank of Singapore chief investment officer, said the bank prefers to look at specific SGD bonds and not at SGD bonds as a sector. "We think the SGD market may be a bit less vulnerable to rate rises than the USD market," he said. Expectations are for two to four rate hikes by the Fed this year. "From a credit quality point of view, a specific approach is more feasible . . . On that basis we think the overall credit situation in Singapore is sound," said Mr Jooste.